Leonard Joseph Augustine Sr., age 88, of Ellis, Kansas passed away Monday, October 15, 2018 at Hays Medical Center with his twelve children by his side. He was born November 5, 1929 in Ellis to Joseph and Sophia (Weber) Augustine. He married Otillia “Tillie” Flax on August 21, 1950 at St. Mary’s Church in Ellis. She preceded him in death on August 17, 2015. Leonard started the family dairy farm in 1953. 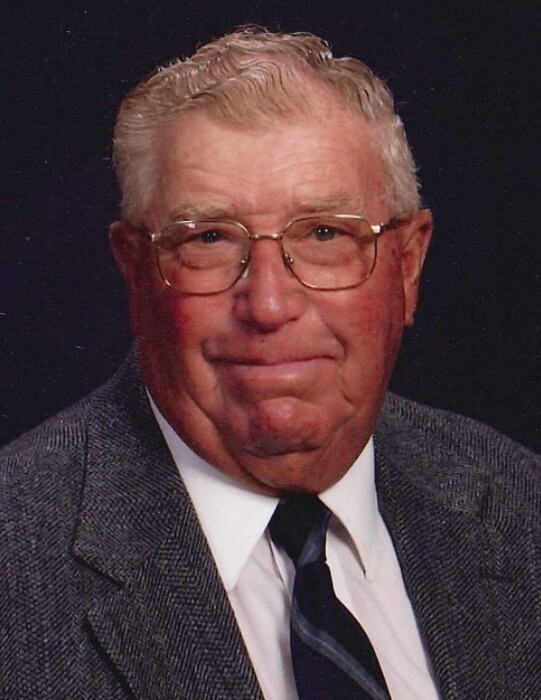 Along with the dairy farm he worked at Trego County Soil Conservation Office, Cedar Bluff Reservoir Survey Crew and Oil Refinery, Golden Belt Coop in Ellis where he delivered feed and worked at the service station, and Mid-America Dairyman Milk Plant in Ellis until his retirement. His favorite hobby was music. He played with the Dutchmasters polka band, the Hermanettes, the Leonard Variety Band as well as numerous other bands spanning 31 years. This was something Leonard and Tillie enjoyed spending weekends in music halls. The Catholic church was very important to Leonard in his faith life being very active in the church. Leonard was drafted into the US Army in 1951 and served until 1953. He was stationed in Aberdeen, Maryland where he earned a diploma in bakery school. It was common for him to cook for 1,300 servicemen daily. He is survived by his children, Loretta (Elmer) Zerr, Melvin (Becky) Augustine all of Salina, Dewayne “Dewey” (Pam) Augustine, Kenneth “Luther”(Donna) Augustine all of Colby, Richard (Deanna) Augustine of Hays, Michael (Linda) Augustine of Ellis, Randy (Elaine) Augustine of Hays, Darrell Augustine, Leonard Jr. (Cheryl) Augustine all of Ellis, Kathy (Rod) Stack of Salina, Timothy (Lori) Augustine of Ellis and Mark (Noalee) Augustine of Hays; a brother, Harold (Kay) Augustine of Hutchinson, two sisters, Dorothy (Eddie) Younger of McPherson and Janie (George) Daniels of Laramie, Wyoming; three sisters-in-law, Margie Augustine of Hays, Phyllis Augustine of Hutchinson and Rosita Augustine of Topeka; 24 grandchildren and 24 great grandchildren. He was preceded in death by his parents; a grandson, Eric Augustine; brothers, Elmer, Donald, Larry and Robert and a sister, Martha Beer and her husband William Beer. Funeral services will be 10 AM Friday, October 19, 2018 at St. Mary's Catholic Church in Ellis. Burial with military honors will follow in the church cemetery. Visitation will be Thursday 5:00 PM - 8:00 PM with a combined rosary and parish vigil at 7:00 PM all at St. Mary's Church. Memorial contributions are suggested to St. Mary’s Church or the Good Samaritan Society, Ellis. Arrangements in care of Keithley Funeral Chapel 400 E 17th Ellis, KS 67637.